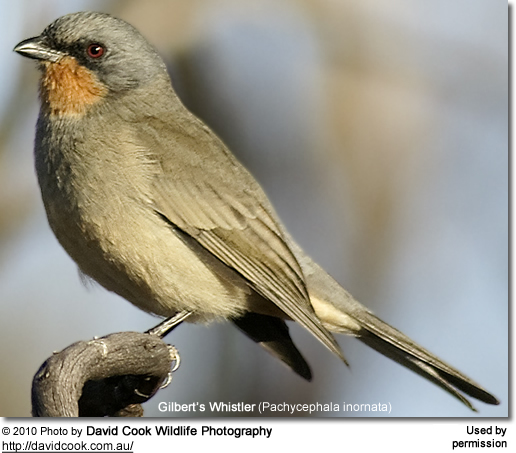 The Gilbert's Whistlers (Pachycephala inornata) - also known as Black-lored Whistlers, Red-throated Whistlers or Red-throated Thickheads - occur naturally in Australia. Range: Northwestern and northern Victoria north to central New South Wales. The plumage is mostly greyish, paler below. The throat is ochre. The lores (area between the eyes and the bill) are blackish. The small bill is cone-shaped, with a light down curve to the upper bill. The eyes are reddish and the legs and feet dark. These whistlers mostly feed on insects.